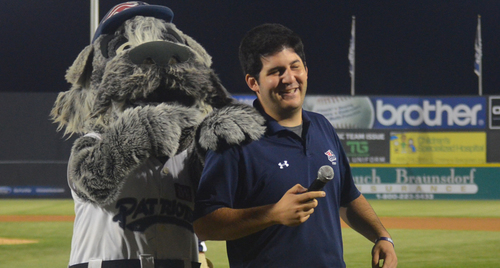 Bridgewater, NJ- The Somerset Patriots have announced that Marc Schwartz has been named the radio broadcaster for the 2017 season. Schwartz was hired as the Somerset Patriots’ Media Relations Manager in November of 2014 and will also continue in that role with the team throughout the year. The Syosset, New York native takes over the broadcasting responsibilities from Justin Antweil, who served as the team’s radio voice for the past five seasons. Antweil decided it was time to pursue other opportunities to help advance his broadcasting career and reach his ultimate goals in the field. Schwartz began his broadcasting career at Quinnipiac University, where he was a multi-sport broadcaster for all four years with the Quinnipiac Bobcats Sports Network (QBSN). While at Quinnipiac, Schwartz interned as the radio broadcaster for the Keene Swamp Bats, a collegiate summer league baseball team in the New England Collegiate Baseball League (NECBL), and as a fill-in broadcaster for Yale University athletics. After graduating from Quinnipiac in 2013, Schwartz worked as a broadcast/ media relations intern for the Charlotte Stone Crabs, the Advanced-A affiliate of the Tampa Bay Rays. There, he was the play-by-play broadcaster for every home game and select road games while also handling all communications for the team. The next year, Schwartz worked as the broadcast & media relations assistant for the Long Island Ducks, calling 46 games and assisting in all team communications. “I can promise our fans that I will work as hard as I can every night to provide a professional, entertaining and informative broadcast. I would like to thank Justin for his help during this transition and wish him nothing but the best in his future opportunities," Schwartz added. In addition to his on-air responsibilities, Schwartz will continue his work in the media relations department, assisting in all aspects of communication, video production, SPN.tv, Social Media and sales. The Somerset Patriots led the Atlantic League in attendance in 2016, finished with the best regular season record in the league and made their fourth straight trip to the playoffs. The schedule for the 2017 season, which includes the team’s 20th Anniversary and the 2017 Atlantic League All-Star Game at TD Bank Ballpark, has been released. For more information, stop by TD Bank Ballpark, call (908) 252-0700, or visit www.somersetpatriots.com.